Islamberg and the other ‘Muslim only towns’ and these organizations are led by a radical cleric in Pakistan named Sheikh Mubarak Ali Gilani. He is the leader of Pakistani terrorist organization Jamaat al Fuqra . Muslim shoe bomber Richard Ried allegedly was heavily influenced by the group and its leader Gilani. Jamaat al Fuqra is the Pakistani Islamic group responsible for a string of murders, bombings and other terrorist acts across the world, including in the USA. Its chapter in America calls itself, “Muslims of America” (MOA), and actively recruits at mosques and prisons, where African-American inmates are especially targeted. And Syed Mubarak Ali Shah Gilani is the man whose Al Qaeda links Daniel Berg, the Wall Street Journal reporter, was investigating and on his way to interview in Pakistan as arranged in 2002 when he was betrayed and eventually beheaded. Pakistani police arrested Syed Mubarak Ali Shah Gilani after Berg’s murder. Islamberg has a makeshift mosque, a shack that is modestly named, “International Quranic Open University.” and occasionally holds public relations events to project a non-threatening image to the non-Muslims outside. 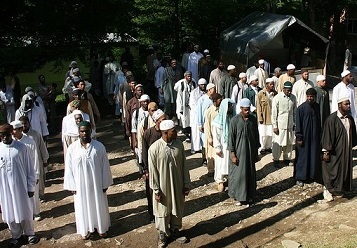 In 2012, a former high-level Muslims of the Americas member that lived at Islamberg for two years described widespread abuse, forced marriages and brainwashing at the commune. He said that almost all of the children are privately schooled and are illiterate. He said that he saw a 50-year old woman tied to a tree and beaten for violating the strict moral code. 4 US Marines Killed By Rampaging Gunman Called Muhammad!